Quality from the brand you can trust! Found naturally in brewer's yeast, whole brown rice, pumpkin seeds and apricot seeds, Pangamic Acid (also referred to as Vitamin B-15) has been used for centuries to help support healthy lungs and heart. Vitamin B15 may even help support endurance and fight fatigue. 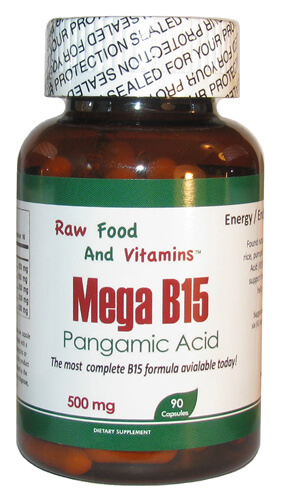 Many people also take Vitamin B15 while they are taking Vitamin B17 (Amygdalin). Both are found naturally in the kernel of the apricot seeds. Many people believe they work together to get the most out of your B17 diet. Suggested Use: As a dietary supplement take up to six (6) capsules per day with a meal, unless otherwise instructed.